Lead free crystal wine decanter. Eisch Crystal Jaguar Decanter with Stainless Steel Base - "No Drop Effect"
31.5oz (0.93L) Lead-Free Glass Wine Carafe. The Zalto Axiom lead free wine decanter is dishwasher safe. Designed for all red or white wines. Float system of wine preservation system. The glass stopper blocks the air and preserves you wine for several days without any added gas. 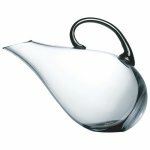 Crystal Decanter - "No Drop Effect"
Hole as part of handle makes this "jug" easy to pick up and pour. 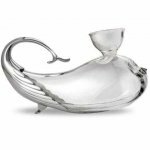 Beautiful Eisch Duck Crystal wine Decanter - "No Drop Effect"
Wine decanter with glass stopper & handle. Capacity: 33.8 oz (1 litre). Size: Roughly 6 ½” tall and 7” diameter in base. 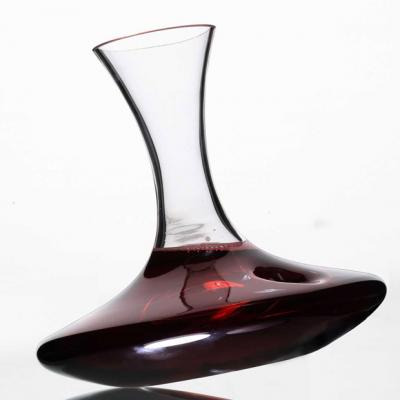 The Siena Decanter has a creative design, which ensures that your wine is perfectly aerated. 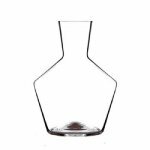 Up and Down Decanter designed to be used as a standing decanter or on its side. Wine Decanter with Wine Funnel that helps sieve and aerate the wine. Mouth Blown - 34oz (1L) Glass Wine Decanter. 34oz (1L) Glass Carafe Wine Cooling Set. This clear glass carafe is hand made, mouth blown. Narrow neck for comfortable grip. Wide surface area for maximum aeration and space for wine to breath. Beads Wine Decanter, Palladio Collection - by Royal Selangor. Designed with beaded pewter detailing around spout. 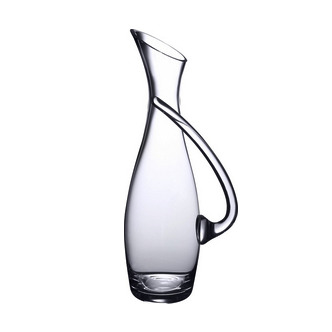 1 Litre Glass Decanter for wine, water sangria or any liquid you want to keep cold. Ideal decanters for young wines must ensure that a significant surface area of the wine is in contact with the air, and so are either of a "flattened" shape with a broad base, or horizontal, of "Duck" style. Aged wine is both delicate and fragile by nature. It must be decanted carefully making sure it is poured slowly down the neck of the decanter, to ensure very slight oxygenation. This will gently deliver its aromas, already at their peak. Decanters for older red wines are generally taller in shape with a long neck The narrowness of the neck allows air flow to be regulated thus gently awakening the aromas. Based is softly rounded. 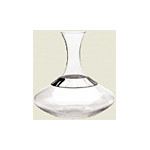 A Decanter Stopper is also frequently used with decanters for Aged Reds. White wines' aromas are both subtle and ephemeral, reluctant to reveal themselves.The aim of oxygenating a white wine is both to release its aromas by oxygenating the molecules, and also to protect them from evaporating too rapidly. 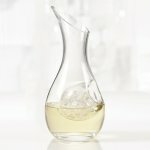 White wine decanters are available in two different designs. One design comes slim and tall with an oblong base and a long narrow neck which limits the air circulation and slows the dissipation of aromas. The second design is made round, with sides that can be plunged into an ice bucket and cooled at frequent intervals. Decanters are available for shipping throughout the USA and Canada.